Currently we can Only attend to 1000 accounts, Apply to get yours before we run out! If you have signed up to ARTMAZON™ as your online Marketing channel we can create and countersign a Certificate of Authenticity for each of your Artwork we sale, this would ensure that only the originals of your work is sold. We would also Act on your behalf to track any ilegal copy of your work and take approparate actions to protect your interest. An example of our Certificate of Authenticity can be found below on this web page. Certificates of authenticity is a means of adding facts about an artwork, and to prove its authenticity. The certificates should contain information such as title, medium, date, signature, etc., which can possibly make an art buyer more comfortable with buying an artwork. It is a document that the art collector can hold onto, and applied as proof of an artwork’s genuineness. 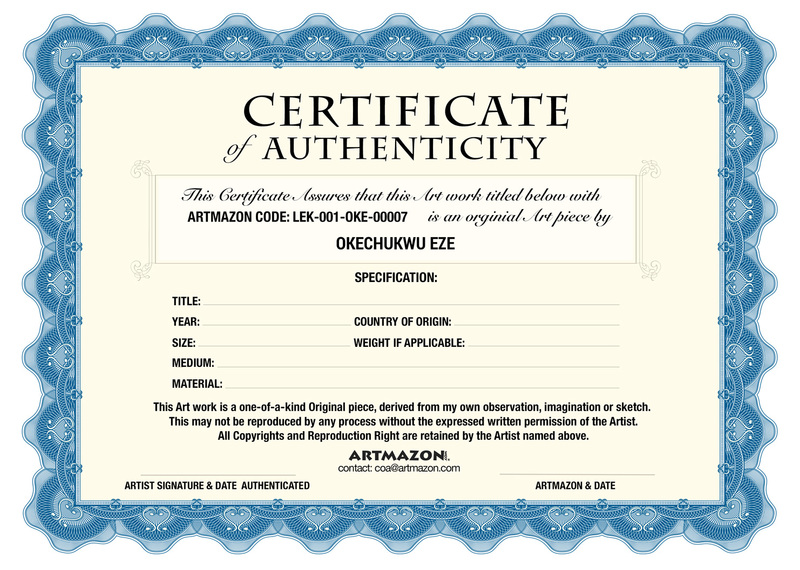 Certificates of authenticity adds a layer of perceived value and trust for an artist, making artworks easier to sell. For more info about Certificates of authenticity CLICK HERE.